The Epilepsy Institutes of the Netherlands Foundation (Stichting Epilepsie Instellingen Nederland, or SEIN), based in Heemstede, the Netherlands, specializes in the diagnosis, treatment, support and research of epilepsy. Through its three clinical centers, 12 outpatient clinics, and other residential and special education facilities throughout the country, SEIN strives to improve the quality of life of people with epilepsy. The institute and its 1,300 employees also provide multidisciplinary care to people with complex forms of epilepsy. To perform the highly regulated exchange of information that allows SEIN to carry on its work—for example, sharing data with hospitals and insurance companies—SEIN asked Yenlo, WSO2’s global strategic implementation partner, to develop a solution for improving information flow and integrating processes. Yenlo chose to implement the open-source WSO2 Enterprise Service Bus (ESB) running on the SUSE Linux Enterprise Server operating system. Using WSO2 ESB, SEIN now runs critical business processes and manages patient information according to the requirements of the Health Level Seven (HL7) standard, securely and rapidly exchanging data across information systems internally, as well as with external organizations. As a medical institution, SEIN must deal with higher levels of information system complexity than faced by other businesses. There are strict requirements regarding the privacy of patient data, lab results, and medication records. Additionally, there are rules for the retention and auditing of data, as well as access logs. In the Netherlands, the Electronic Patient Record (EPD) system, the Electronic Prescription System (EVS), Physician Information System (HIS), and other sources of data must be shared freely but securely, so that SEIN can maximize quality patient care. "We are the focal point of everything that has to do with epilepsy in the Netherlands, so our employees are constantly in contact with each other, with various hospitals and outpatient clinics, and also with universities and research institutions," said Jean Willem Barzilay, CEO and chairman of the board of directors at SEIN. "To retrieve patient information, to consult with each other, or to exchange research data, our staff needs an IT landscape that facilitates data exchange." Adding to the complexity, SEIN's existing IT systems mostly existed in silos or were connected to each other via direct point-to-point interfaces that were complex and expensive to maintain. This made it difficult to exchange information efficiently and securely with other institutions and even within SEIN itself. "It was obvious that this was not an efficient way to do our work," said Barzilay. "Since everyone had their own information storage, it was difficult to reuse data or work together on certain documents." Seeking greater agility and higher consistency in how information is stored and distributed, SEIN realized that it needed a new framework on which varying systems could connect to each other more effectively. SEIN turned to Yenlo because of the IT provider's expertise in resolving complex process integration challenges, and in building greater flexibility and agility into networks. "We knew that we needed high availability from a middleware solution, along with high performance," Barzilay recalled. "We also needed standardization, both for the way data is exchanged and for the systems we use." The Yenlo team quickly determined that the best architectural approach would be a serviceoriented architecture in which an enterprise service bus (ESB) served as the backbone to handle all mediation and transformation of services. Additionally, the team decided to build the integration platform on products that were open source and supported open standards. As the infrastructure for the integration platform, Yenlo chose SUSE Linux Enterprise Server, providing a reliable, scalable, and secure server operating system that is ideal for powering physical, virtual, and cloud-based mission-critical workloads. Yenlo then selected WSO2 Enterprise Service Bus, which is based on the open-source Apache Synapse ESB, to run on top of the Linux server and handle the integration. One key factor in the decision was the configurability of WSO2 ESB, which required less programming than other ESB options evaluated, thereby simplifying the process of connecting to other systems. Another consideration was its proven ability to run more than 1 billion transactions per day in a production environment, ensuring high performance and availability. "WSO2 ESB made sense for this project because it connects to anything; its interoperability and high performance meant that all of SEIN's data sources could communicate with each other," said Ruben van der Zwan, CEO of Yenlo. "Moreover, the WSO2 ESB and SUSE Linux combination created a flexible and robust integration platform at a competitive cost." Another key benefit of WSO2 ESB is that it supports the HL7 protocol for the exchange, integration, sharing, and retrieval of electronic health information. By managing data according to HL7 standards, organizations like SEIN can ensure that healthcare information is shared efficiently and accurately, meeting regulatory requirements and speeding care to patients. "In the health sector, there are many partners that need to exchange data intensively for regulatory reasons, and to manage the specialized services they provide as caregivers," explained van der Zwan. "So you need to choose the right tools to make this workable. WSO2 ESB allows this information be exchanged with maximum security so that SEIN adheres to HL7 standards." Implementation of the middleware platform was fast, with the first services deployed in just one month. Today, SEIN's EHR database and Neurology server communicate via a WSO2 ESB cluster running on SUSE Linux. Third-party systems that need to communicate with the SEIN systems do so by communicating with ESB proxies that sit in front of the Cisco firewall that SEIN has in place. The rest of the systems reside in the demilitarized zone (DMZ) sitting behind the firewall. In addition to using WSO2 ESB for mediation and transformation of services, Yenlo has implemented WSO2 API Manager and WSO2 Business Activity Monitor (WSO2 BAM). WSO2 API Manager provides a complete solution for publishing APIs, managing developers' access, and scalably routing API traffic. Using API Manager, SEIN can easily publish its APIs, which partners can access and use to link their services to those of SEIN. Meanwhile WSO2 BAM enables SEIN to monitor the system’s performance metrics. The integration platform currently supports critical business solutions such as the ZorgMail email system, Vecozo healthcare communications software, Grouper Health Information Systems, and patient information using the HL7 standard. SEIN's EHR database and Neurology server communicate via a WSO2 ESB cluster running on SUSE Linux. 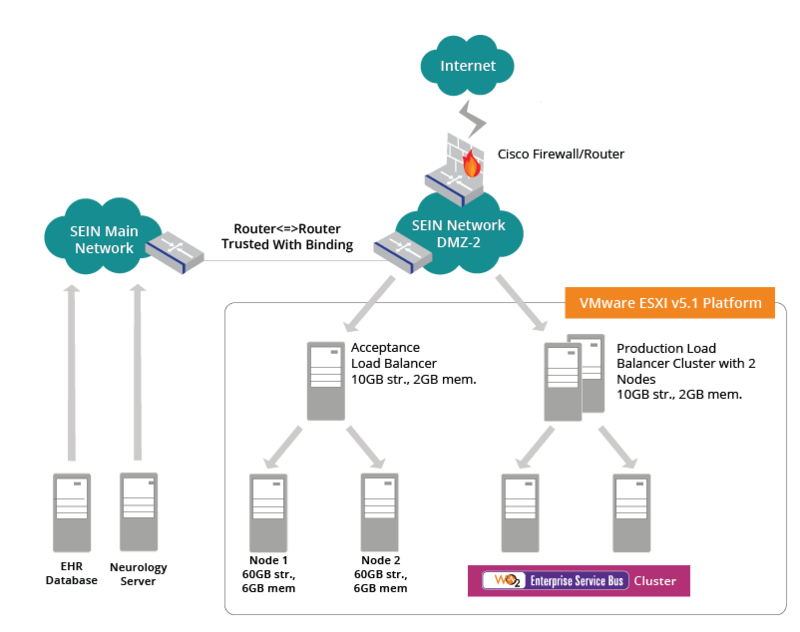 Third-party systems that need to communicate with the SEIN systems do so by communicating with ESB proxies that sit in front of Cisco firewall. The rest of the systems reside in the demilitarized zone (DMZ) sitting behind the firewall. As a result of the implementation of WSO2 and SUSE, SEIN is now able to quickly exchange data between organizations and information systems using less than 60% of the time and budget originally required. "Using the WSO2-SUSE combination, we now exchange data in a clear way, with one technique and standardized coupling," said SEIN's Barzilay. "Information is no longer stored in various individual systems, but can be accessed in a centralized manner. Standardizing based on open source software naturally entails cost reduction—and now, expensive, proprietary software is no longer needed." Centralized data management is helping SEIN offer faster, more accurate access to patient information: "Since information is centralized and not duplicated elsewhere, errors are less likely," Barzilay said. "Now each document will have a single owner, helping improve patient service and privacy." With the integration platform in place, SEIN has the freedom to add more software to support business processes throughout its networks and fold in new sources of data with high availability and zero concerns about compatibility. This is possible because WSO2 ESB handles all mediation and transformation, so the integration logic no longer resides on the different applications integrated into the system. As a result, it is easy to add a new application or Web service without affecting any of the existing applications; any changes are simply made to the ESB. There is no need to develop individual connectors. "Yenlo is currently implementing new information systems, and we expect them to be plug and play," Barzilay said. WSO2 also offers a unique benefit: Since all products within the WSO2 Carbon enterprise middleware platform are built on a common, componentized code base, they are pre-integrated, providing a modular pluggable approach to building a solution. For example, in the near future, Yenlo will also help SEIN implement WSO2 Governance Registry to support SOA governance and WSO2 Identity Server for identity management of enterprise Web applications, services, and APIs. When they are implemented, the WSO2 graphical management console will automatically recognize that they have been added, providing the opportunity for all of the WSO2 products to be viewed and managed from a single console if SEIN wishes to do so. "We knew at the start that we wanted to build a solution for SEIN that could grow and adapt to its changing needs, while still adhering to strict requirements for the exchange of healthcare data," van der Zwan said. "Using WSO2 Carbon, we've met these goals, and today SEIN has a middleware platform that offers the flexibility and ease of integration to address whatever the future may bring."